Back to Liholiho’s trip … it was taken partly by curiosity to see foreign lands, and partly by a desire to secure protection for his country, especially against Russia. A council of the high chiefs was held at Lahaina to consider the subject, at which Kaahumanu was acknowledged as regent with Kalanimōku as her prime-minister, and Kauikeaouli confirmed as heir-apparent. On the 4th of July, Liholiho was sufficiently well to give an audience to Richard Charlton, Esq., the newly appointed consul to his dominions. By the 8th, no hopes of the queen were entertained; the mutual grief of the royal couple was affecting. The king was supported by pillows, and said little, but repeated the words, “I am dying, I am dying:” within the curtains of the bed one of the chiefs sat continually, with his face towards the king, and his eyes fixed on him, in conformity, as they said, with their native customs. 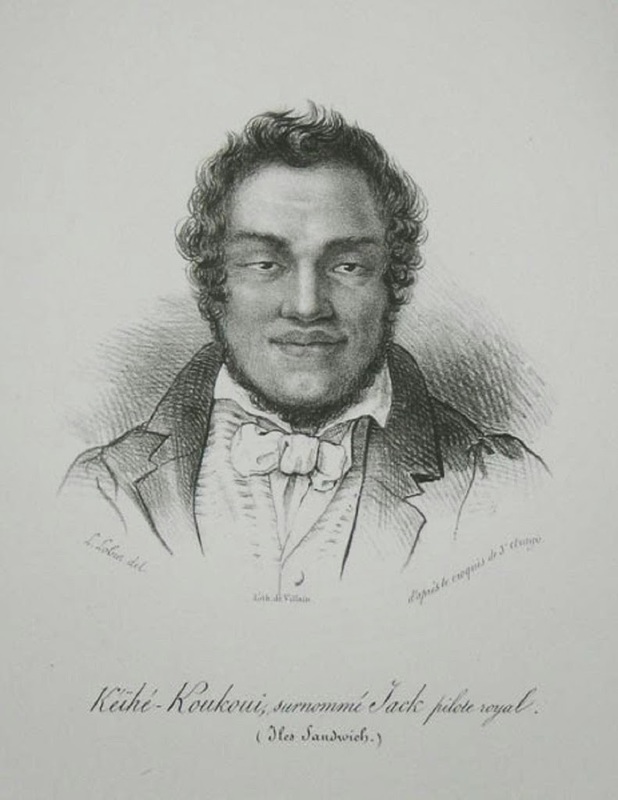 The grief-stricken Kamehameha II (age 27) died six days later on July 14, 1824. Prior to his death he asked to return and be buried in Hawai‘i. The remains of the sovereigns had been placed in lead coffins, enclosed in wood, covered with crimson velvet, and richly ornamented. Suitable inscriptions in English and Hawaiian told the rank and age of the deceased. The Blonde arrived back in Honolulu on May 6, 1825. Liholiho and Kamāmalu were buried on the grounds of the ʻIolani Palace in a coral house meant to be the Hawaiian version of the tombs Liholiho had seen in London. They were eventually moved to Mauna ‘Ala, the Royal Mausoleum. Kamehameha II was succeeded by his younger brother Kauikeaouli, who became King Kamehameha III. Kapihe had one daughter, Kalama. When it came to selecting a wife, Kamehameha III chose Kalama, although Kamanele, daughter of Gov. Adams, had been proposed as the most suitable, as to age, rank and education. The image shows Kipahe (Naihekukui, Captain Jack, Jack the Pilot.) It was drawn by Arago. In researching my great, great, great grandfather I fell upon the Charles Kana’ina probate documents where my ancestor relates the last time he saw Kana’ina’s father Eia with his stepmother Kahipa after they had moved to Molokai. The statement says he saw them both when Kamehameha II and the Queen were returned to Honolulu from England. Kana’ina had married Kekauluohi and the two were the caretakers for the Royal Tomb at Pohukaina. My ggg grandfather Kilinahe, lived at Pohukaina for a few years while serving for Ka’ahumanu and Kamehameha III. Kana’ina and Kilinahe were first cousins as was Iahuula, Kapihe’s (Naihekukui) wife and the mother of Kalama, Kan’ina’s neice. Iahuula (Kamala’s mother) was the daughter of Eia and Kauwa, who were, of course, Kana’ina’s parents. Kauwa was the sister of my 5x great grandmother, Kaleimanokahoowaha. Bothe Kauwa and Kaleimanokahoowaha were sister of Kana’ina I. Thanks for the pic and the histrory. I was aware that Captain jack was somehow related but I didn’t know this. Thanks for the genealogy information on him and the great pic.